My grandfather, Papap, died when I was a young child and I don't have many memories of him. But I feel like he's always had a presence in my life, albeit through plants. The stories I've been told by my father depict an earnest, hardworking man who had no temperament for suffering fools. He worked in the coal mines, a profession he followed his father in when he was just a boy. Even though he was over the age of the draft, he still volunteered to fight in WWII. I do remember eating Klondike bars with him and my Grandmother in their kitchen in Green Tree, PA. And I have a memory of him telling me not to drink a large glass of soda on the good couch (I think I was 6 or so around this time). Before he passed away, he had given my father several gifts of plants over the years. They were always there growing up, Papap's black walnut trees growing in our yard, Papap's grapevines slowly overtaking the trellis down by the fire pit, and Papap's horseradish spreading out around the mulch pile. A few weekends ago, while visiting my parents, my Dad asked me if I would help him harvest some horseradish root. I said sure, and asked him if he'd ever harvested it before. "Nope," he replied, "It's been growing there undisturbed for over twenty-five years. It should be real 'vintage' horseradish by now." 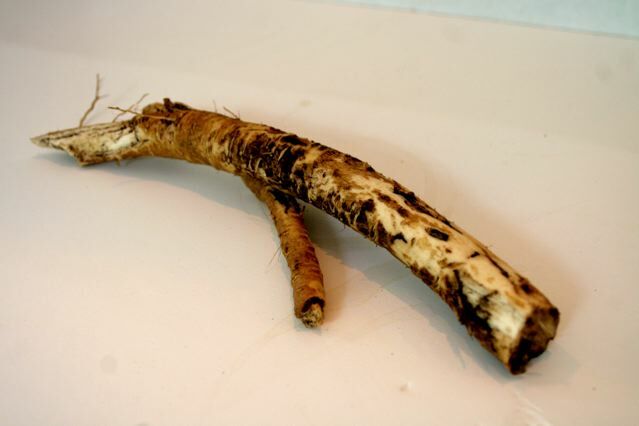 Reading about horseradish, it reminds me of mint; once you plant it, it's there for life. I read a few different sites about harvesting horseradish, but the most interesting one was a scanned pamphlet meant for commercial growers. The pamphlet's instructions were brief on harvesting horseradish, it mostly reiterated over and over that you had to completely clean your equipment after harvest. If you used a harvester to tear up the roots for collection, like you would for potatoes, that might leave little dangling slivers of horseradish root stuck in the combine's teeth. Run that again through a potato field and you're pretty much planting horseradish "seedlings" all though your field. The pamphlet almost felt like I was reading instructions for a quarantine. The other advice was to wait 12-18 months before harvesting from initial planting. But that didn't seen to be an issue for a plant that's only 3 years younger than me. Testing the waters, I dug up a shallow root on the edge of the plant's foliage, and once I severed the root, the air filled with a sinus-clearing pungency. I was surprised that all the roots seemed to be growing horizontally, rather than vertically, but that's apparently pretty common for horseradish. The root itself was great, with a big snappy flavor and "hot" bite. I mixed it into a creamy chicken salad, which was a nice way to enjoy the flavor and not go into a sneezing fit. One thing I am curious about is how far and deep this monstrous plant has spread in it's quarter-century life. I think next time I'd like to dig right in the mulch pile that it rings, and see more than the tip of the iceberg. I love "sinus-clearing pungency." Always great writing side-by-side with great food.